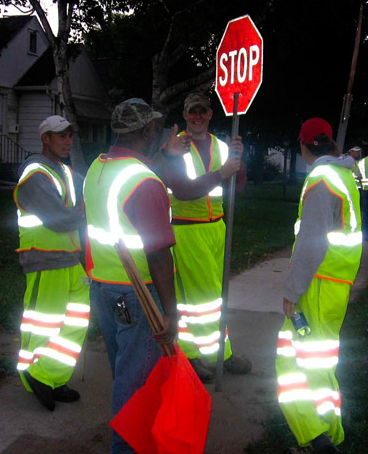 A vital part of the paving crew, traffic control personnel ensure the safety of the crew and the public traveling around the work zone. Whether with flags, cones, barrels, barriers, or electronic warning signs, they control the flow of traffic and make the work area safer for everyone. With a fleet of over 40 units, Meigs Trucking, Incorporated is dedicated to the hauling of bituminous products throughout Wisconsin and adjoining states. Dispatched from two Wisconsin locations, we are available to do contract hauling of liquid asphalt products for anyone in the asphalt industry. We are staffed with highly trained and experienced professional drivers whose main focus is on meeting the needs of our customers. We take pride in having earned the reputation of "safe and superior service" and we strive to maintain this mark in every load that we deliver. Our fleet includes state of the art distributors designed for the application of emulsified asphalt to road surfaces. These units are staffed with the best operators in the industry. Give Meigs Trucking a call today to see how we can assist you in your asphalt hauling needs.